BETSY FRANCO has written over eighty books, including poetry collections, picture books, and a YA novel. Her anthologies of teenage poetry have appeared on the ALA Best Books and Quick Picks lists. Betsy lives in northern California, with her husband and two cat-muses, Jada and Frida. MICHAEL WERTZ has taught Illustration at the California College of the Arts and is the co-founder of Monster Illustration, a loose confederation of illustrators who banded together in 1996. Michael lives and works in Oakland, California, with his husband and their dog Olive, who helped inform Michael's observations of the neighborhood cats. "An ideal match of subject and form....Cat-lovers will feel a shock of recognition....Together, poet and artist convey the silliness of cats and their humans without ever being silly themselves....From acrobat-flipping to toilet-bowl-sipping, couch-scratching to dog-catching, words and pictures blend together to create a funny celebrate of all things feline." 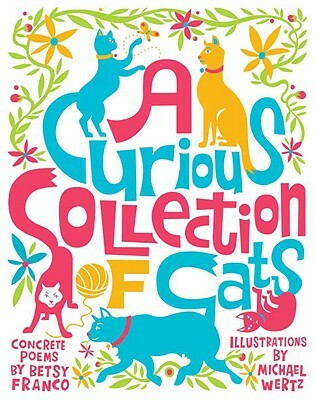 "Every cat lover and classroom will want to add this purrfect book to their libraries, and will certainly want to share this on ewith a cat or two." "Thirty concrete poems that stretch, crouch, pounce, and purr across the pages, like their feline subjects."